Strange but true, a new website has been launched for the anxiously-awaited project pairing icon LOU REED with legendary metallers METALLICA. 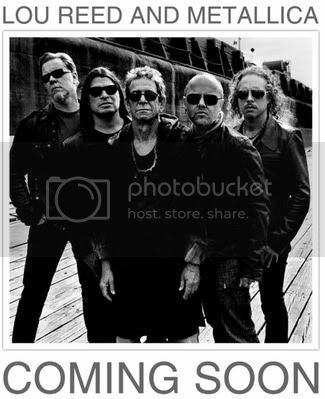 Check it out at Loureedmetallica.com and stay tuned for news about the album soon! "Ever since we had the pleasure of performing with Lou at the 25th Anniversary of the Rock And Roll Hall Of Fame at Madison Square Garden in October of 2009, we have been kicking around the idea of making a record together. Some of you astute Bay Area residents may have picked up news of recent Lou Reed sightings in the greater San Francisco area and we have indeed been working at our home studio at HQ on and off over the last few months. In what would be lightning speed for a Metallica related project, we recorded ten songs during this time and while at this moment we're not exactly sure when you'll hear it, we're beyond excited to share with you that the recording sessions wrapped up last week. A true innovator and easily one of the most influential songwriters, musicians, and performers in rock music history, Lou's work with the Velvet Underground and as a solo artist has such an enduring quality that he has long been revered and respected by us and many of our peers. We can't wait for you to listen to the finished record, so as we like to hear ourselves say around here, keep watching this spot for updates . . . we'll be back with more details as they come together."